By all rights, I shouldn't have written this story. Tin Man: Pirates of the Nonestic was supposed to be a one-shot novel. I told my friend who read the first draft as a reward for helping me with M.A. Exam Part One edits there was no sequel planned when she begged for one. I loved Syfy Channel's Alice miniseries but had no desire to fix or change anything. 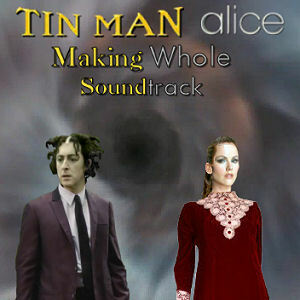 Then Tin Man Crossover Fanfiction issued its first Crossover Challenge. Catyuy had asked me nicely for an Ambrose/Azkadellia-centric story eventually, when I got less busy, so there was the Tin Man half. How do they meet Wonderland and Alice and Hatter back on Earth? Once I figured out the plot, it was simple to set it after Pirates of the Nonestic. For starters, Tin Man: Dragons and Ninjas is already a crossover and its epic sequel is going to touch on every universe I have written fanfic for. And while I did have the idea of having Hatter working for Samaritans Inc., I decided that this was less confusing for poor Alice. Where to put Wonderland was answered very simply because I spent over a month working on the O.Z. Map Project. Since Wonderlands has Scarabs, the distance didn't matter as much, so Wonderland is on another continent. It also gave a way to illustrate Azkadellia and Ambrose already at odds with each other. I had the hardest time with the first section. I didn't want to spend too long with the filler the characters had to go through, and that made the transitions dicey. Ambrose's line "Do you think your mother will forgive DG if you snag a king?" is the second line I jotted down as I started writing notes on Making Whole. Of all the characters, I would have thought it would be hardest to get into Jack Heart's head especially since I gave myself a bruised forehead from slapping it over his stupidity in the miniseries. To my surprise, his head was the easiest to get into. And Ambrose is scary when he's upset. This section explains why Ambrose turned down Azkadellia's proposal, but what I didn't have room for was the real cause of his pain. I put a tiny hint of it in the header for the LiveJournal submissions. Lovers at odds seem to end up in Wonderland, but does this realm have a way to give Azkadellia what she wants no matter how hard Ambrose objects? Warnings: Since I already have crossovers galore with the Zackverse in Dragons and Ninjas, I decided this would be a sequel to Pirates of the Nonestic. No spoilers for the novel. Also I blame this idea on Raynz. That's right, neither the Witch nor Azkadellia said what to do to Ambrose beyond the brain removal and Raynz took the extra step of the vasectomy all on his own. Because of it, Ambrose refuses to commit to Azkadellia because she deserve a man who can father a child. Az takes her bewilderment of why Ambrose doesn't propose to her sister. DG's advice was for Az to do the proposing. The whole ugly truth came out instead and inspired the first line I wrote in the notes: "What devil possessed me to take DG's advice? All my baby sister has ever managed to do is get me in trouble." The Duchess and Azkadellia's conspiracy leads Az and Ambrose to the Other Side via the Looking Glass and to meeting Hatter and Alice. Their adventures there would be fodder for another couple of stories, so I'm leaving the option open on those. Ambrose does eventually get the surgery he needs, and the Wonderland gang will get invitations to Azkadellia and Ambrose's wedding. I've been having issues with getting stories posted in a timely fashion, on top of how long it takes me to write them. I finished Making Whole on January 14, 2010 in time for the contest, finished editing the HTML version on March 19, 2010, and finally posted it to the Library on January 30, 2011. In between all that, I also wrote my first author's commentary on this story. I hadn't planned on this story having a soundtrack. Usually, the songs present themselves before or while I'm writing. This time around Ambrose's and Azkadellia's themes wormed their way into my brain long after the story had been published. 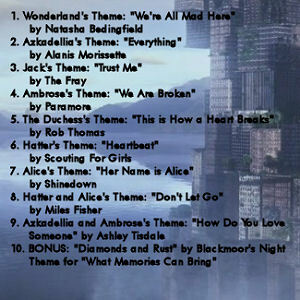 BONUS: "Diamonds and Rust" by Blackmore's Night - Theme for "What Memories Can Bring"
Since I could only find nine songs to fit Making Whole and I usually don't bother with a soundtrack unless I get ten songs together, I included the theme song for Tin Man: What Memories Can Bring. This way readers can hear it without the pesky restrictions my website host decided to put me under. To download the zip file, click on the album cover images.